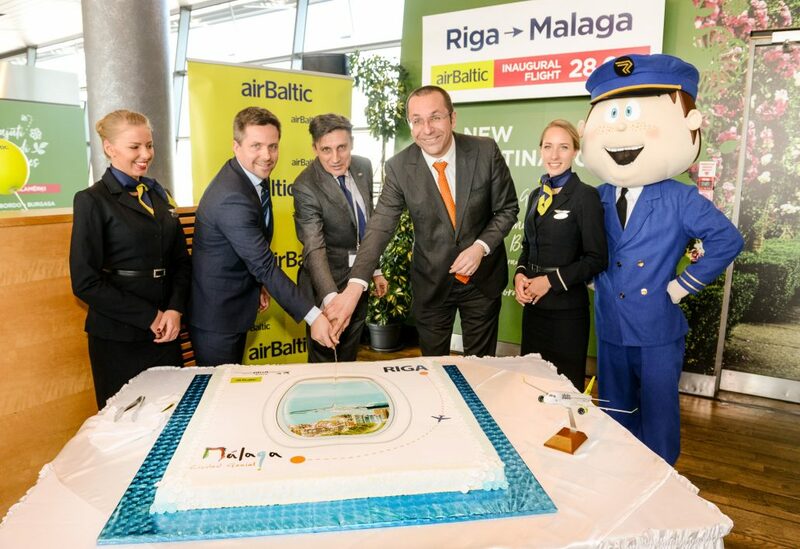 The Latvian airline airBaltic has launched a new direct route linking Riga with Malaga in Spain. Starting on March 28, 2018, airBaltic flies from Riga to Malaga two times per week using its Bombardier CS300 aircraft. From left: • The Ambassador Extraordinary and Plenipotentiary of the Kingdom of Spain to Latvia HE Mr Pedro Miguel Jimenez Nacher • Director of Aviation Services department at Riga International Airport Liene Freivalde • SVP Network Management at airBaltic Wolfgang Reuss. Top image from left: • Member of the Board at Riga International airport Artūrs Saveļjevs • The Ambassador Extraordinary and Plenipotentiary of the Kingdom of Spain to Latvia HE Mr Pedro Miguel Jimenez Nacher • SVP Network Management at airBaltic Wolfgang Reuss.